Women's Original Adjustable Gloss Rain Boots is rated 4.4 out of 5 by 87. Conçue pour permettre un port flexible, la botte ajustable montante Original s'inspire de l'emblématique Original montante avec l'ajout d'un soufflet extensible à l'arrière. Parfaite pour les mollets plus larges, cette botte au fini lustré procure la facilité de mouvement et d'ajustement de la coupe Hunter traditionnelle, tout en assurant plus d'aisance lorsque le soufflet est entièrement étendu. Fabriquée à la main en caoutchouc naturel, la botte ajustable Original est entièrement imperméable et comporte une confortable doublure en polyester et la semelle Hunter Original. Rated 5 out of 5 by LAHS50 from My favourite style This is my third pair! I wear them until they wear out! I usually get a good two years. I Love these boots so much! Looking forward to the hot pink coming back in stock this summer?!? 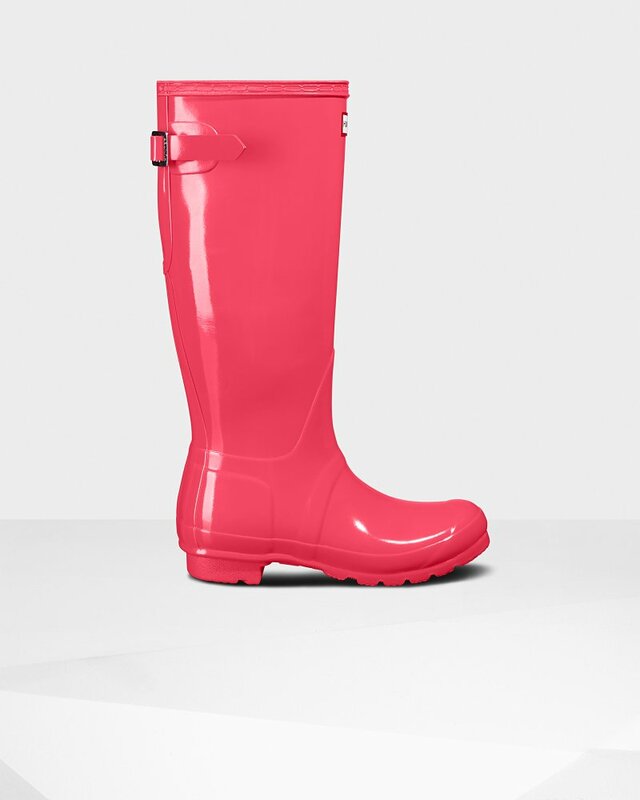 Rated 5 out of 5 by kelpat59 from Controller I originally bought the regular tall Gloss Rain Boots and was very sad that they did not fit around my calf. I am a lift weights and my calves are larger than normal. I was excited to hear that they had an adjustable replacement. They are perfect.... I love them and they have a large assortment of the colored socks... So I can finish off a total look with my rain boots and color coordinated socks to my outfit.. Rated 5 out of 5 by Kellie from Amazing Boots I bought these, very skeptical. I wear them almost every day. They are so comfortable and warm it's truly amazing. My feet always dry and so toasty . Getting my 2 kids pairs for Easter. Rated 5 out of 5 by Mermaiden from Great for the plus size lady! Im a size 18/20 and i thought my calves would be too big for these boots. I thought wrong. I got them in green and LOVE THEM! I get many compliments. Order up plus size girls! Hunter is for you too! Rated 5 out of 5 by Tarahung from Love love love!! Just got these last week for my daughter and she loves them!! Comfy, comes with a couple of boot cleaning wipes. They’re a beautiful make, sturdy! I originally wanted for myself but Christmas gift comes first! Rated 5 out of 5 by Mair2303 from Beautiful Boots These are actually my fourth pair of Hunter Boots (I love all the colors) and the only Adjustable pair I have. They are really comfortable and would be suitable for those with bigger calves more so than my tall boots. I bought a pair of green. Not only are they practical boots to wear in wet Eastern Canada weather but are quite fashionable as well.